The Best Prostate Cancer blogs from thousands of top Prostate Cancer blogs in our index using search and social metrics. Data will be refreshed once a week. Also check out Top Prostate Cancer Youtube Channels list for Top videos on Prostate Cancer. Prostate Cancer newsletter is a comprehensive summary of the day's most important blog posts and news articles from the best Prostate Cancer websites on the web, and delivered to your email inbox each morning. To subscribe, simply provide us with your email address. Santa Monica, CA About Blog The Prostate Cancer Foundation (PCF) is the world’s largest philanthropic source of support for prostate cancer research to discover better treatments and cures for prostate cancer. PCF accelerates the world's most promising prostate cancer research. Facebook fans 165,334. Twitter followers 9,384. About Blog Read the latest Prostate Cancer news and articles. Stay informed about approved therapies, new medications, and developments to treat Prostate Cancer. Facebook fans 1,515. Twitter followers n/a. Norwalk, CT About Blog Authoritative updates for clinicians on prostate cancer treatment, PSA screening, prostatectomy vs surveillance, chemoprevention, and radiation and proton therapy. Facebook fans 6,539. Twitter followers 15,601. New York, NY About Blog Renal & Urology News publishes timely news coverage of scientific developments of interest to nephrologists and urologists, including in-depth coverage of all relevant medical conferences. Read the blog to stay up to date with the latest prostate cancer news and clinical reviews, disease, symptoms, treatments and more. Facebook fans 5,483. Twitter followers 8,924. Rockville, MD About Blog Learn the symptoms of prostate cancer. Read current medical research on new treatment options, vaccines, surgery and prevention. Facebook fans 1,759,755. Twitter followers 210,582. United States About Blog The latest prostate and prostate cancer research from prestigious universities and journals throughout the world. Facebook fans 195,134. Twitter followers 78,672. India About Blog Medindia is a leading provider of online health information and services to consumers, physicians, healthcare professionals and corporations globally through its websites, applications, product and service offerings. Explore the blog to find latest news and research on prostate cancer. Facebook fans 38,640. Twitter followers 5,090. London About Blog Latest news and research from Nature.com on the topic of Prostate cancer. Facebook fans 641,139. Twitter followers 920,986. About Blog This blog is committed to providing accurate and up-to-date information for people with prostate cancer and their families. It's a helpful resource if you're looking for guidance on risks and prevention. Prostate Cancer International will transform global understanding of the risks associated with prostate cancer and the strategies to manage those risks until prevention is possible. Facebook fans 479. Twitter followers 352. About Blog Dr. Garnick is an internationally renowned expert in medical oncology and urologic cancer. A clinical professor of medicine at Harvard Medical School, he also maintains an active clinical practice at Beth Israel Deaconess Medical Center, and has dedicated his career to the development of new therapies for the treatment of prostate cancer. About Blog Founded in 1997, Malecare is America’s leading men’s cancer survivor support and advocacy national nonprofit organization. If you're looking for the latest news on prostate cancer research and treatments, check out the posts that explain how new steroids are used to treat advanced prostate cancer, or browse through information about diet, treatments, disease progression and more. Facebook fans 5,073. Twitter followers 6,337. Washington, DC About Blog ZERO - The End of Prostate Cancer is a national nonprofit organization with the mission to end prostate cancer. ZERO advances prostate cancer research, encourages action, provides education and support to men and their families. Facebook fans 25,653. Twitter followers 8,106. New York, NY About Blog The Sperling Prostate Center in New York City and Florida is a technologically-advanced, patient-oriented practice dedicated to providing the most effective techniques in prostate cancer diagnosis and treatment. The mission is to educate the world about the value of MRI in prostate care. Facebook fans 534. Twitter followers 138. Manhattan, New York About Blog Dr. David Samadi is a board certified urologic oncologist trained in open and traditional and laparoscopic surgery and is an expert in robotic prostate surgery. Read the blog to find helpful information. Facebook fans 548,244. Twitter followers 54,721. Boston, MA About Blog Harvard Health features posts from Harvard Medical School physicians and our editors on a variety of health news and issues. Subscribe us to get articles about prostate cancer from Harvard Health. Facebook fans 144,583. Twitter followers 2,349,657. San Francisco, CA About Blog This sub-reddit is for the discussion of prostate cancer, related news, new developments and studies, personal stories and ask question about anything related to prostate cancer. Facebook fans 1,120,276. Twitter followers 489,602. Houston, Texas About Blog Baylor College of Medicine is a health sciences university that creates & applies science and discoveries to further education, healthcare & community service. Follow to get news about prostate cancer from Baylor College of Medicine. Facebook fans n/a. Twitter followers 14,479. Alexandria, Virginia About Blog Cancer.Net provides doctor-approved cancer information from ASCO and resources for patients. Follow to get more information about prostate cancer. Facebook fans 50,916. Twitter followers 11,768. About Blog Cancer Compass is dedicated to provided you with the most up to date cancer information and news. Subscribe us to find all our articles on Prostate Cancer News, as well as healthy living tips for dealing with cancer. Santa Monica, CA About Blog The Prostate Cancer Foundation (PCF) is the world's largest philanthropic source of support for prostate cancer research to discover better treatments and a cure for recurrent prostate cancer. Facebook fans 190,785. Twitter followers 11,088. About Blog Prostate Cancer Free blog will help educate you on the prostate, prostate cancer, diagnosis, treatment, effectiveness and side effects. Facebook fans 2,804. Twitter followers 38. New York, NY About Blog Latest prostate cancer news, articles, research and treatment study results for oncology nurses to assist in delivering updated patient care for prostatic carcinoma. Facebook fans 2,450. Twitter followers 2,705. London, UK About Blog Ben Ong is widely regarded as the world’s leading expert on natural integrative treatments for metabolic prostate disease. Stay up to date with the latest health news complied and updated weekly. Facebook fans 1,703. Twitter followers 927. About Blog With specialist prostate cancer treatment clinics in Germany, Austria, Switzerland, and now in the USA, Vitus are the world leaders in prostate cancer treatment, offering patients hope, innovative treatment and impressive results. Facebook fans 232. Twitter followers n/a. About Blog Prostatepedia connects prostate cancer patients, prostate cancer support group leaders, and health care providers with key opinion leaders in the world of prostate cancer research and treatment. Facebook fans 5,003. Twitter followers 183. Facebook fans 548,249. Twitter followers 54,635. Birmingham About Blog The Birmingham Prostate Clinic is a national centre of excellence providing advanced treatment for the prostate, bladder, penile and urethral conditions. Read the blog to find useful information on prostate cancer. Facebook fans n/a. Twitter followers 4,812. Atlanta, GA About Blog This blog focuses on research and innovation into new cancer treatments. Our cancer specialists are committed to giving cancer patients the hope and care they deserve using the latest cutting edge technology. Facebook fans 67,189. Twitter followers 24,550. About Blog This Prostate Cancer Blog provides information, helpful tips, and coping strategies for wives and partners of men with prostate cancer. New Zealand About Blog Prostate Cancer Foundation of New Zealand (PCFNZ) is a non profit community based organization which assists with supporting Prostate sufferers and their families. Read the blog to find latest prostate related news from around the world. Facebook fans 2,417. Twitter followers 98. Knoxville, TN About Blog Provision Cares Proton Therapy Center is a member of Provision Healthcare, nestled in the beautiful Dowell Springs campus. Read the blog and find useful knowledge on prostate cancer. Facebook fans 2,096. Twitter followers 903. About Blog Prolaris provides a new measure of the aggressiveness1,2 of an individual’s prostate cancer. Prolaris provides personalized information for men diagnosed with prostate cancer to help assist in determining the best possible treatment plan. Facebook fans 143. Twitter followers 437. Richland, WA, USA About Blog Isoray Medical, Inc. is an innovative company that designs and develops state-of-the-art, personalized brachytherapy products that provide a more cost-effective cancer treatment. Facebook fans 690. Twitter followers 704. About Blog PCCN-Toronto is a group of prostate cancer survivors (which includes partners) who volunteer to provide support to men, from the newly diagnosed to long-term survivors, and their partners and families. About Blog Dr. Michael Lazar, a Santa Rosa urologist and prostate cancer specialist, is the only Northern California physician recognized as a leader in the use of high-intensity focused ultrasound (HIFU) for prostate cancer. Explore the blog to find a vast array of articles that will provide you with sufficient information on prostate cancer. Facebook fans 260. Twitter followers 264. Aurora, Colo. About Blog The University of Colorado Cancer Center is a distinction recognizing its outstanding contributions to research, clinical trials, prevention and cancer control.Subscribe us to get news about prostate cancer from the University of Colorado Cancer Center. Facebook fans 5,830. Twitter followers 8,249. About Blog Read the blog to stay up to date with the latest news on prostate cancer. Facebook fans 359. Twitter followers n/a. Facebook fans 9,028. Twitter followers 128. New York, NY About Blog Ed Randall's Fans 4 the Cure blog is dedicated to Prostate Cancer awareness & education. Prostate Cancer early detection saves lives. Help us spread the word! Facebook fans 886. Twitter followers 1,460. About Blog BXTAccelyon is fast becoming one of the leading partners to hospitals and clinics worldwide in providing brachytherapy to treat prostate cancer. Find more about the disease and the therapy by reading the blog. Facebook fans 314. Twitter followers 125. Silverlake Wa About Blog Although Todd Seals was diagnosed with terminal prostate cancer, he doesn't let his diagnosis stop him from living life to the fullest. Through his blog, he shares his personal story and encourages his readers to make the most out of every second, minute, hour, and day. About Blog Cancer Health provides accessible information about cancer prevention and treatment to people with cancer and their caregivers. Subscribe to know more about Daniel Zeller's journey with prostate cancer. Facebook fans 19,154. Twitter followers 856. Australia About Blog Australian Prostate Cancer is dedicated to improving lives through vital research into the prevention, management & treatment of prostate cancer. Facebook fans 668. Twitter followers 353. Calgary About Blog The Prostate Cancer Centre in Calgary supports excellence in prostate cancer awareness, education, treatment, advocacy and research with the ultimate goal of eliminating advanced prostate cancer. Facebook fans 1,400. Twitter followers 2,658. About Blog Allen Edel is a patient advocate for men with prostate cancer, and has been published in the Journal of Urology. He writes a regular column for the New Prostate Cancer Infolink, and works with support groups. About Blog An award winning blog on 'Healthline' (USA) written by Daniel Sencier, a prostate cancer survivor. Westmont, Illinois About Blog The idea was to provide state-of-the-art prostate brachytherapy to our patients with the best equipment and a well-trained staff in a patient-centered facility. We pride ourselves on treating prostate cancer patients with a focus on quality of life. Facebook fans 632. Twitter followers 783. Facebook fans 259. Twitter followers 8. South Florida About Blog Prostate cancer patient diaries, articles, and resources on prostate cancer from Dr.Suarez Miami. About Blog Thoughts and updates about prostate cancer - written primarily for patients and their families. Canada About Blog Prostate Cancer Canada Network Toronto is a volunteer, non-profit prostate cancer support group, run by prostate cancer survivors helping men diagnosed with this disease. Facebook fans n/a. Twitter followers 15,947. London About Blog The Prostate Cancer Research Centre carries out research into the causes of and treatment for the UK’s most frequently diagnosed male cancer. The centre's mission is to raise funds to undertake research that will improve the survival and quality of life of men with prostate cancer. Facebook fans 3,840. Twitter followers 3,620. About Blog The Genitourinary (GU) Oncology Program at Weill Cornell Medicine is dedicated to providing cutting-edge care for every stage and type of prostate, kidney, bladder and testicular cancer. Read the blog to find articles on prostate cancer. Facebook fans 148. Twitter followers 206. About Blog Prostablog is a blog by Jim Tucker who had a decade-long brush with prostate cancer. About Blog The Prostate Cancer Institute of LA specializes in the prevention, diagnosis and treatment of all stages of prostate cancer. Learn more about high intensity focused ultrasound and hyperthermia therapy by reading our prostate cancer blog. About Blog The author shares his prostate cancer experience. Read the blog to find helpful information. About Blog The Palpable Prostate features more than 200 blog posts on topics related to prostate cancer. The more information you have about this disease, the easier it is to cope. This is an excellent resource for finding an abundance of tips and guidance. About Blog I'm Janet Worthington. I am a daughter, wife, sister, mother, and an award winning author on men's health. I write Vital Jake for the man who goes to the doctor regularly or should see the doctor even if he feels he doesn't need to go. Charlotte, NC About Blog HIFU Prostate Services was founded to provide men access to a less invasive treatment option for prostate cancer. Our mission is to deliver the highest quality care, support and technology to the patient. Mountain View, CA About Blog Comprehensive up-to-date coverage for prostate cancer, aggregated from news sources all over the world by Google News. Facebook fans n/a. Twitter followers 213,264. Westmont, Illinois About Blog Prostate Cancer Foundation of Chicago is a non-profit organization dedicated to improving quality of care and quality of life by funding patient support programs, clinical research as well as professional and public education. Our goal is to further promote public awareness, cancer prevention, detection and treatment options to prostate cancer patients, their families and medical professionals. Facebook fans 490. Twitter followers 616. About Blog The After Proton Blog is my best shot at telling the rest of the world about protons, prostates, and people from our unique perspective. About Blog Austin CyberKnife is a department of University Medical Center Brackenridge. The center provides the only CyberKnife technology in the greater Austin area for treatment of cancerous and noncancerous tumors. Facebook fans 5,598. Twitter followers n/a. About Blog - Dr. Sanjay Razdan is the most experienced Robotic Prostatectomy Urologist in Miami & considered by many to be the best Robotic Prostate Surgeon in the USA. Facebook fans 61. Twitter followers 7. About Blog Alarcon Urology provides comprehensive, compassionate patient- centered family urology care to men, women and children of all ages. Read the blog to find useful insights on prostate cancer. Europe About Blog Europa Uomo is the European advocacy movement for the fight against prostate cancer. Europa Uomo's objective is to increase awareness on prostate cancer in Europe. Europa Uomo is a European coalition of patients supporting groups for prostate diseases in general and prostate cancer in particular. Facebook fans 224. Twitter followers 30. Dallas, TX About Blog Yet Another Prostate Cancer Blog helps other people with prostate cancer realize that they're not alone. The blogger provides an open and honest look into his life as he undergoes treatment. About Blog The mission is to be the reliable source of prostate cancer information that is accessible to patients, advocates, physicians, care providers, researchers, and Florida's governing officials. About Blog The blog is the author's story of dealing with prostate cancer using natural methods. Read to find more information. Facebook fans n/a. Twitter followers 1,726. St. Petersburg, FL About Blog Dr. Eric Diner specializes in robotic surgery including prostatectomy, nephrectomy, uterine surgery as well as the treatment of many urological conditions.Explore the blog to find useful insights on prostate cancer disease. Facebook fans 84. Twitter followers 192. About Blog Explore the blog to find lots of valuable articles, latest scientific innovations and the newest and most efficient treatments regarding prostate cancer. Also get inspired by reading the many stories of men who managed to survive the disease. About Blog Author Janet Farrar Worthington blogs about men's health from a woman's point of view. Read to find about prostate problems. Los Angeles, Ca About Blog Learn more about high intensity focused ultrasound and hyperthermia therapy by reading the prostate cancer blog. Comprehensive Urology provides patients with state of the art urological care in a personalized & compassionate environment. Facebook fans 2,235. Twitter followers 695. About Blog Where is your Prostate is a blog about Living and Loving With Prostate Cancer. Follow to know more on how to cope with the emotional, relational, sexual and spiritual aspects of prostate cancer. About Blog The purpose of this blog is to provide information for men diagnosed with Prostate Cancer so they can make an informed decision about all options for their own treatment. A second opinion from a Proton expert explaining the Proton option is extremely important. 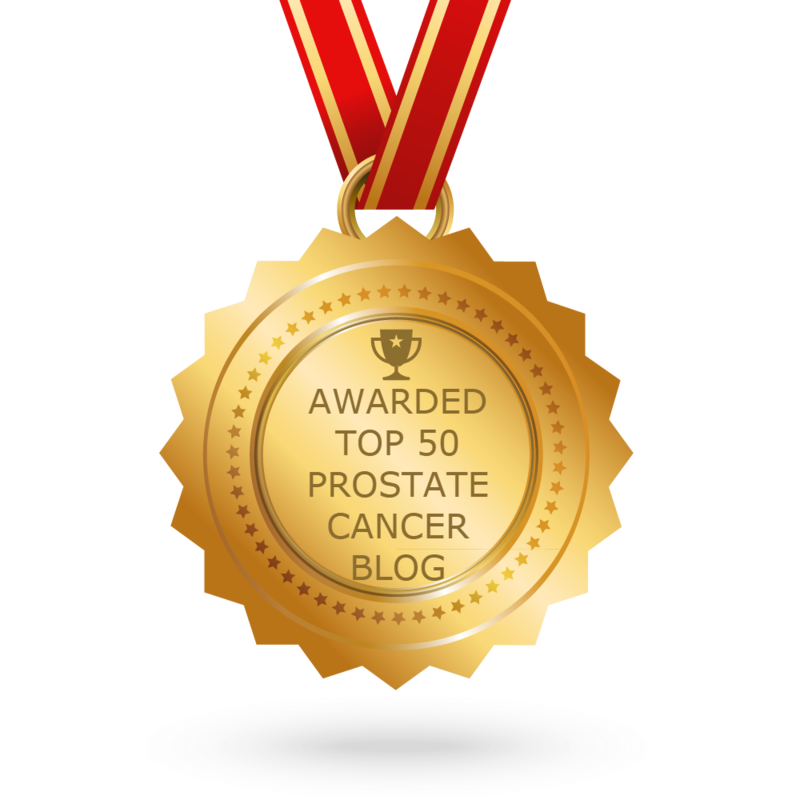 CONGRATULATIONS to every blogger that has made this Top Prostate Cancer Blogs list! This is the most comprehensive list of best Prostate Cancer blogs on the internet and I’m honoured to have you as part of this! I personally give you a high-five and want to thank you for your contribution to this world.